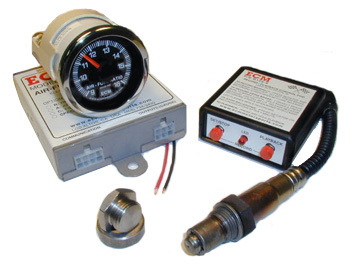 The G100-RAC combines four important features into a single system: a wide-range AFR sensor, an easy-to-read gauge, data recording with playback,and a linear 0 to 5 volt analog output. The 270-degree sweep gauge has a black or white backlit face, an illuminated pointer, and is highly visiblein both daylight and night conditions. The analog output is suitable for input into a data acquisition system or engine controller. Data recording can be triggered either manually using the buttons on the Record/Playback Control Pod, or automatically by the release of a wheel or transmission brake using a 12 volt signal. Recordings of up to one minute can be made and the data is retained even if the vehicle's battery is disconnected. Holding down the Playback button plays back the AFR data on the gauge and the analog output.